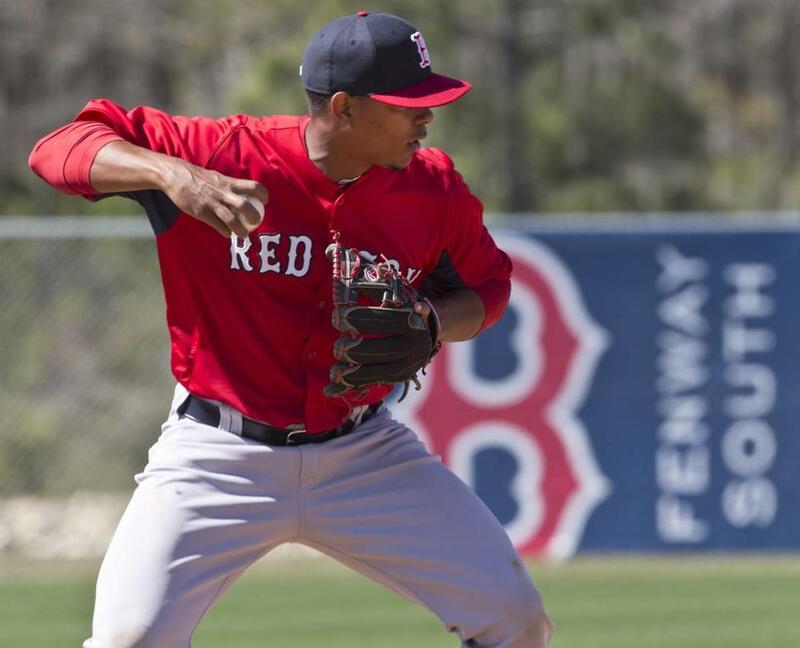 Portland shortstop Xander Bogaerts (.310 batting average) could be off to Pawtucket soon. Since he was 16, the spotlight on Michael Almanzar has been blinding. As the son of former major league pitcher Carlos Almanzar, baseball was in his blood. From Toronto to San Diego, New York to Cincinnati and Texas, he grew up in clubhouses. When the Red Sox signed Almanzar, a corner infielder with eye-popping power potential, he had raw tools but limited organized experience. Still, at 16, he received a $1.5 million signing bonus, and the expectations that came with it. In 2008, when Almanzar breezed through the Gulf Coast League with a .348 batting average, it seemed like he’d have no issues living up to them. He was promoted to Single A Greenville that summer, and Kevin Boles was the Drive manager. He saw a player with a lot of things to manage and also a lot to learn. “It’s a lot for a young man to handle,” said Boles, now the manager at Double A Portland. “He handled it pretty well. There were some times where being 17 years old, you’re a little bit immature at times — obviously we all were at 17. We didn’t have it all figured out. Almanzar spun his wheels in Single A for five years. When he was promoted to Portland this season he was reunited with Boles. Seeing the growth in Almanzar has shown Boles both how quickly five years can fly by and also how long ago it can seem. In 54 games this season, Almanzar is hitting .283 with 11 home runs and 41 RBIs. The turning point came last season with Salem, Boles said. Almanzar hit .300 with 12 homers and 54 RBIs in 124 games, and reduced his strikeouts for the third year in a row, down to 77. A consistent work routine, improved mechanics at the plate, and better work habits have enhanced the natural athleticism that made Almanzar’s potential so alluring. “He’s comfortable in his own skin,” Boles said. “He’s getting bigger and stronger. He knows who he is. He knows what type of ability he has and it’s pretty exciting to watch. Jose Iglesias’s success with the Red Sox could bring a promotion for shortstop Xander Bogaerts. Bogaerts, 20, has been ripping up the Eastern League, hitting .310 with six home runs and 32 RBIs in 50 games. In his last 10 games, Bogaerts is batting .485 (16 for 33) with four homers, 11 RBIs, and eight runs. Before Iglesias was called up last month, the pipeline at shortstop seemed clogged. Now there is room for Bogaerts to play at Pawtucket. Brock Holt, whom the Red Sox acquired from the Pirates in the Joel Hanrahan deal, is the PawSox’ current shortstop. The way Brandon Workman was carving up lineups at Portland, a call-up was only a matter of time. The 6-foot-4-inch righthander, the Sox’ minor league pitcher of the year last season, was promoted to Pawtucket Wednesday. In 11 games for the Sea Dogs (10 starts), he had a 5-1 record and 3.43 ERA, with 74 strikeouts in 65⅔ innings. His final start was among his best, eight innings of one-run ball against Altoona June 1, with just three hits allowed. Henry Owens: In his past two starts, Salem’s 20-year-old lefty has given up three hits over 11⅓ innings. He took a no-hitter into the sixth inning in a 3-2 win over Myrtle Beach May 31, striking out seven. He threw 5⅓ one-hit innings Wednesday against Winston-Salem, walking five but striking out six. His 3.21 ERA is tops among Salem starters. Drake Britton: Throwing 62 of his 82 pitches for strikes Wednesday, Portland’s 24-year-old righthander tossed a season-high eight innings (the first six hitless) and fanned a season-high eight in a 6-0 win over Erie. Cody Koback: The Greenville outfielder is working on a 17-game hit streak, batting .338 (22 for 65) with seven doubles, eight RBIs, and four multi-hit games. Greenville second baseman Mookie Betts and designated hitter David Chester were named to their first All-Star Game; the South Atlantic League showcase is June 18. Betts ripped through May, stringing together a 19-game hit streak while batting .356 with 19 extra-base hits and six homers. Chester has some of the best power numbers in the league with nine homers and 45 RBIs. He leads the Drive in total bases (92) and is tied for the team lead in hits (52) . . . Salem catcher Blake Swihart finally hit his first homer of the season Tuesday. After hitting seven homers in 92 games with Greenville last season, Swihart needed 43 games (144 at-bats) to go yard this year. Over his last seven games, he’s hitting .440 (11 for 25) with six extra-base hits, three RBIs, and four walks. . . Rubby De La Rosa is starting to see his workload increase. He had his longest start of the season, 4⅔ innings, Sunday against Syracuse. He struck out seven and gave up just three hits, throwing a season-high 83 pitches.